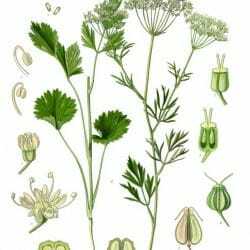 Anise, sometimes called aniseed is a member of the Apiaceae family which includes caraway, celery, carrots among others. The aniseeds are small fruits which impart a signature anethole note. Though many other botanicals, including the similarly named star anise, contain that note, the two anises are botanically different plants. Which makes an important point. In gins, once distilled, it’s hard to pick the difference between the two. The anethole note is there, proving that flavor which suggests “anise.” Given that star anise is much cheaper, it’s a safe assumption that most gins when disclosing botanicals— if they merely say “anise”— they mean the star.